Participants can choose from a 5K run/walk, a 1 Mile walk and a 100-yard kids' dash. Fundraising is optional. All participants will receive a race medal, photos at Home Plate & the Finish line, Race T-Shirt (Performance Tech) and complimentary beverage at the Post-Race Party, courtesy of Fort Myers Brewing Company! Click on the Race Results button to view results and awards. 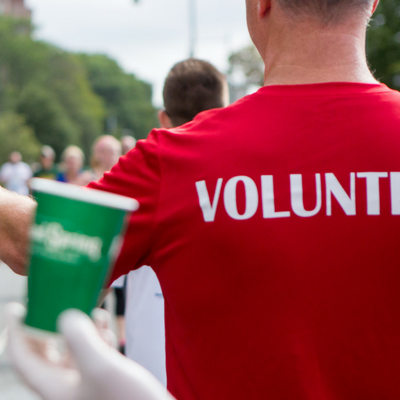 Spend a morning supporting our great cause & go home with a volunteer shirt! 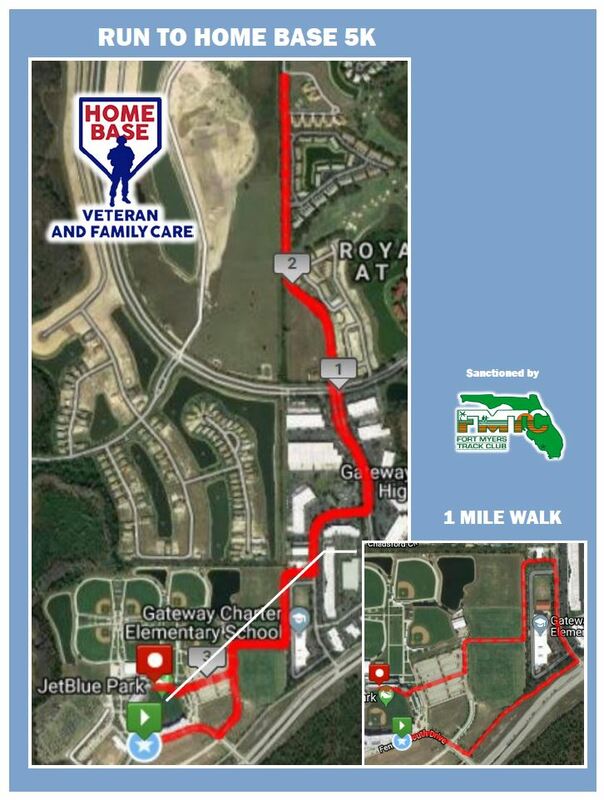 This Run/Walk is a unique fundraising event through the scenic, tropical areas surrounding JetBlue Park - ending with the unforgettable experience of finishing the race by crossing home plate just days ahead of MLB Spring Training. Friends and family can watch you from the stands at Fenway South, with food and entertainment available throughout the day! 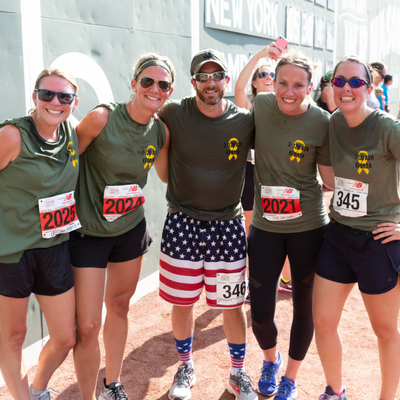 Home Base, a Red Sox Foundation and Massachusetts General Hospital Program, is dedicated to healing the invisible wounds of war for Veterans, Service Members and their Families through world-class clinical care, wellness, education and research. As a National Center of Excellence, Home Base operates the largest private-sector clinic in the nation devoted to healing invisible wounds such as post-traumatic stress disorder, traumatic brain injury, anxiety, depression, co-occurring substance use disorder, military sexual trauma and family relationship challenges for Veterans, Service Members and their Families. All the care provided by Home Base is done so at no expense to the Veteran or their family. Since 2014, Home Base’s Southwest Florida Warrior Health and Fitness program has provided 181 local Veterans the opportunity to improve their well-being through supervised physical exercise and education about healthy eating, living, sleep hygiene, and stress management. This group enables participants to surround themselves with like-minded people and form a new band of brothers and sisters while losing weight and getting fit in the process. In addition to the Warrior Health and Fitness program, Southwest Florida Veterans who seek care for the invisible wounds have Home Base’s Intensive Clinical Program (ICP). The ICP is a two-week, intensive, outpatient program where patients are provided both evidenced-based therapy and complimentary alternative medicine. Created to heal the invisible wounds—post-traumatic stress, traumatic brain injury, military sexual trauma, depression, anxiety, and co-occurring substance use disorders— the ICP offers an approach to healing that includes comprehensive evaluation, individual treatment, group therapy, stress reduction and resiliency, family support and education, integrative therapies and more. Additionally, all Home Base programs are provided at no cost to the Veteran. Since opening its doors, the ICP has benefitted 16 Veterans from Florida. To learn more about Home Base, please visit homebase.org. For questions about clinical care for Veterans, Service Members or their Families, please contact us at homebaseprogram@partners.org or call the clinic at 617-724-5202. Yes, there is a registration fee. Please visit the registration page. Do I need to fundraise in order to participate? No. While fundraising is optional, you have the opportunity to win awesome prizes while raising funds in support of Southwest Florida Veterans and their Families. Yes, the Kids’ Dash is open to all children age 6 and under. There is no minimum age requirement. Can kids participate in the 5K Run/Walk or 1 Mile Walk? 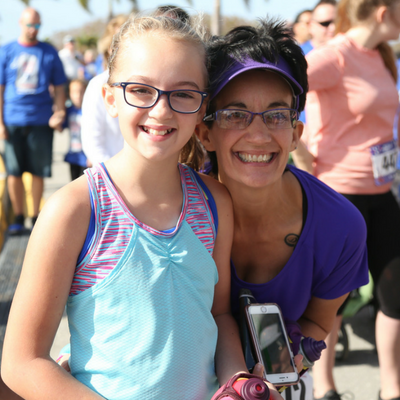 Yes, kids 14 years and older can participate in the 5K Run/Walk and kids 7-13 years old can participate in the 1 mile walk, when accompanied by an adult. The cost for kids to participate in the 5K run and 1 mile walk is the same as adults. Yes, you can register onsite before the event. Will donors receive tax documentations for their donation? Donors who make an online donation will automatically receive an email acknowledging their tax deductible donation for their records. Donors who send in a check will receive a letter acknowledging their donation within 10 business days. If someone gives you cash, you may place the sum towards your run, however we cannot offer a tax receipt, as the team charity did not receive those proceeds directly. My account email and password won't work. What should I do? We encourage all participants to solicit donations via their web pages for the fastest donation processing and most up to date totals. In the case of offline gifts, checks should be made payable to “Home Base” with "2019 Run to Home Base Florida" and the participant’s name in the memo field. Please mail offline gifts to: Home Base Southwest Florida - P.O. Box 422 | Estero, FL 33929. If you have question about offline donations, please contact us.